In the last issue we discussed Feng Shui recommendations for the bedroom. In addition to observing and directing the flow of Qi we can maximise the energetic input with the calculation of the most benevolent sleeping direction. 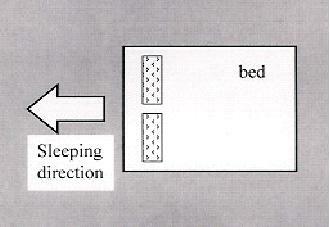 Sleeping direction, in this context, refers to the direction a person’s head points to while lying in bed. A person’s most beneficial direction is equally applicable with the position of one’s desk or any other area a person spends a concentrated amount of quality time. Derived from the Compass School, there are 8 separate compass directions to consider: four major ones (North, South, East, West), and four minor ones (NorthEast, NorthWest, SouthEast, SouthWest). Depending on a person’s date of birth within the repeating cycles of creation, the specific energies of one’s beneficial compass directions are supportive while the others are weakening. 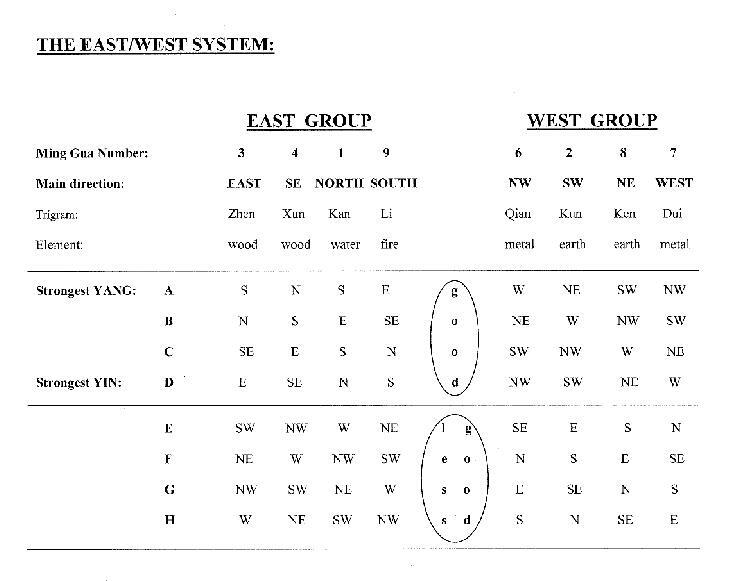 These directions are encompassed in two groups: The EAST Group and the WEST Group. The EAST Group includes North, South, East and SouthEast, the WEST Group covers West, NorthWest, SouthWest and SouthEast. All four directions of one group are therefore supportive, while the four of the other group are considered challenging. When determining your personal number, it is important to remember that the Chinese new year begins around the 4th or 5th of February. Any birthday before then, e.g. the 31st of January 1967 counts as the year before, i.e. the Chinese year of 1966. Only after February 5th the year is counted as it is. If someone is born just at the time of the Chinese year change there is no quick solution. Please consult a book with detailed tables and lists with the exact time of change at the specific year in question. Once we have found the correct Chinese year we may then accurately calculate a person’s most beneficial direction following the specific steps, with different formula’s for male and female. you get a single digit sum. (If the result is 5 the final number is 2 = “Kun”). Jan 18th is still the year 2001 in Chinese calculations!! Take the Chinese year of birth (after Feb. 4th or 5th ) and add the last two numbers until you get a final digit sum. 2. Add 5 to that number if born before the year 2000 or add 6 if born after 2000. (If the result is 5 the final number is 8 =”Ken”). The first 4 directions (lines A to D) all carry supporting energies. Line D shows the most YIN energy direction, therefore carrying more peaceful and calm energy. This is optimal for a good nights sleep. Small children instinctively turn in their sleep orienting themselves towards their ideal direction. However, don’t forget that Geopathic Stress zones need to be avoided foremost because of their toxic nature (please refer to the website if unfamiliar with Geopathology). Lines E through H are the challenging directions bringing restlessness into sleeping areas and fatigue and inability to focus in working environments. You will need a good quality compass to get an accurate reading. Try taking different readings from various spots around your property to gauge any influences from metals or power lines on the compass needle. What happens if the sleeping directions of husband and wife belong to different groups? The compromise in this case would be to strengthen the person with the weaker physical constitution with their beneficial sleeping direction. Another compromise is for one person to receive the support of the house (each house is oriented with its main entrance pointing in a particular direction), while the other one benefits from the position of the bed. Make sure there are no disturbing Geopathic Stress lines. 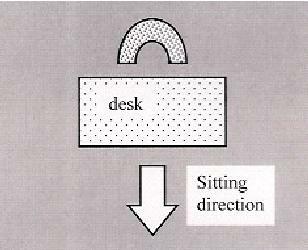 Find a position of strength (the “power seat”) with strong support from the back (armchair position) and a good overview of the room. Calculate and compare the Lucky Directions of all family members. For more information on Feng Shui topics please visit the website www.InstituteofFengShui.com .